As you may be aware, another battle in the “are video games art?” war was kicked off this week thanks to Charlie Brooker, a guy you might have seen on British comedy shows (if you’re me and you’ll watch anything with Martin Freeman in it). He posted a column describing certain video games as the type of “intelligent entertainment” currently being shunned by “Hollywood.” Despite the fact that putting the entirety of Hollywood up on a pedestal of shame is starting to get stale (even when it’s earned), Brooker makes a solid point, mostly because one of the games he points to is Portal 2, an interactive puzzle adventure game created by Valve. Frank, you’re probably a bit aware of the Portal franchise, seeing as you are a worldly man of intellect who does not eschew so-called “low brow” mediums. (I am basing this entirely on your recent promise of a recap of the Smallville series finale.) 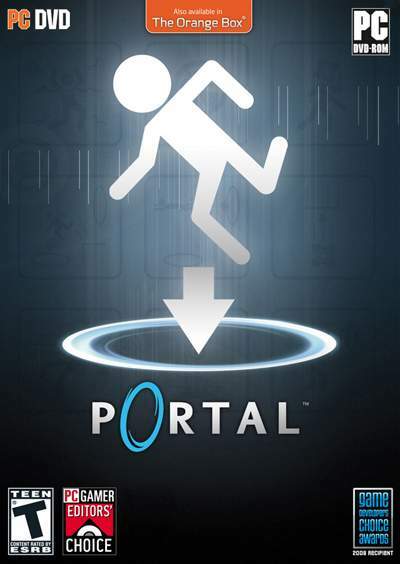 But let me explain what happens in Portal in a way that will make sense to a non-video game enthusiast, because while I won’t say I’ve played a lot of video games, Portal and Portal 2 may be two of the best I’ve ever played. 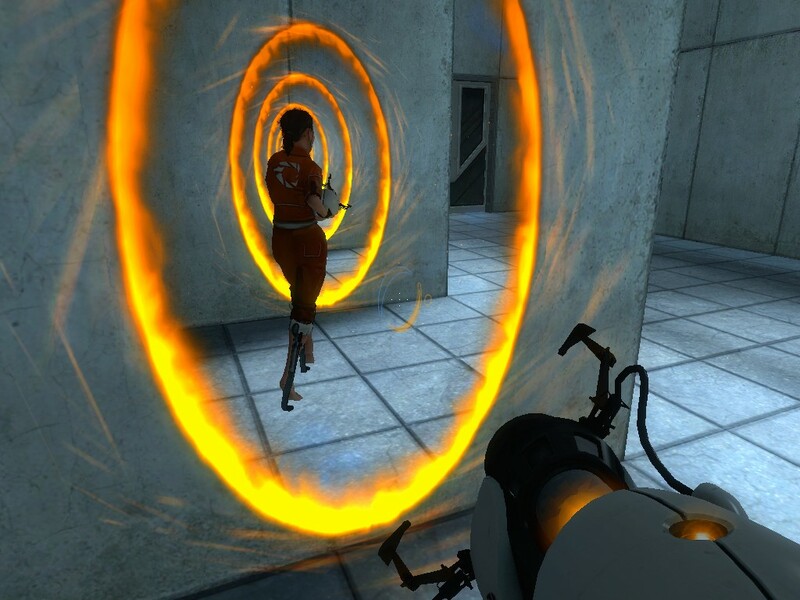 Portal opens en media res in a testing chamber inside the mysterious Aperture Science labs. Unlike film, video games have mastered the implementation of the first-person POV (largely because gamer boys got used to it while fricasseeing Doom monsters with a chainsaw) — thus, you are seeing this through the eyes of Chell, a nice young lady in an orange jumpsuit who serves largely as an audience cypher. Once you exit the chamber via a “portal,” which is essentially a short-cut through space, you proceed to be tested on your ability to use portals to put crates on giant buttons in order to escape rooms. Through and through and through you go -- where the portals stop, nobody knows! At least, it starts off like that. But as you play, you’re quickly indoctrinated into the magic of portal technology, which can not only instantly transport you from one location to the next, but also fling you across rooms, thanks to physics. It takes a few levels but as you complete task after task, you eventually acquire a gun that gives you the ability to make portals, as well as an understanding of how to use them to escape each test chamber. The challenges become increasingly complicated, but the difficulty is scaled remarkably well with a player’s abilities, and frankly playing with portals is just so damn fun. Of course, this isn’t just a free-for-all romp, because you’re trying to escape this research facility whilst being taunted by a computer A.I. named GLaDOS (say it like “Gladys”) who starts off relatively pleasant, but becomes increasingly malevolent. Delightfully, the more evil she gets, the funnier her dialogue becomes. Fan art by McGibs on DeviantArt. I chose not to to delve too deeply into the Internet's depths for this. If you wisely choose not to die a fiery death, then you escape through the inner workings of Aperture Science towards GLaDOS’s chamber, where you (shocker) attempt to destroy her before the neurotoxin she’s released into the air kills you. It’s the only puzzle with a ticking clock attached, which is how you know it’s the toughest battle of the game (the others are not timed, which is good because some of them are TOUGH, yo). Once you kill GLaDOS, you escape and THE END! That is, if you’re playing the original version of the game. Last year, Valve released a new ending, in which you’re recaptured by Aperture and dragged away into nothingness. Why change the ending? Because Valve was making a sequel! And you know what, Frank? I was gonna tell you all about Portal 2 as well in this entry. Because Portal 2, which came out last month, is totally awesome — a sequel that expands upon the original game, gives new depth and meaning to the franchise and along the way explores some interesting themes about identity and science. But let’s stay focused on Portal here, and the question of video games and art. The real value of playing Portal (or watching someone else play Portal) isn’t necessarily the story. It’s a simple story, after all — lab rat vs. maze — with the slow reveal of GLaDOS’s evil and what happened to Aperture’s scientists a nice bonus. But on the surface, the primary appeal is the concept of portal technology, and teaching your brain to “think with portals.” It’s an intellectual challenge, one on par with playing chess or understanding Inception, except that it can be enjoyed socially (i.e. “Oh, look over there, maybe try putting a portal on that!”) and it’s, y’know, fun. There’s skill factor involved — that’s why I mentioned my brother above, as he was generous enough to come over and help me out with some of the tougher puzzles at the end beat the damn game for me with his gamer powers. One of the greatest handicaps for video games getting taken seriously is the fact that if you can’t use the damn controller, you’ll always struggle to appreciate what’s fascinating about the medium, which is specifically this: Video games, thanks to their interactive nature, have evolved to a level where they can be as engrossing and engaging as a great novel or film. By having control over the world, you truly feel connected with it. It’s a remarkable thing. The catch, of course, is that the number of games which make full use of this capacity — that push for the intelligent experience over the crass thrill — are growing but are still not the majority of the industry. And even a celebrated game like Portal 2 has flaws. But while video games are a young medium, their importance in our culture is beginning to grow. Which is to say, Frank, be prepared to hear about more of them. Posted on May 25, 2011, in Some Spoilers, Video Games and tagged let's talk about art, portal, portal 2, valve, who doesn't love an evil snarky A.I.?. Bookmark the permalink. 5 Comments. You forgot to mention that GlaDOS sings a song at the end! A glorious, wonderful song (written by Jonathan Coulton) that’s even better than cake. Forgot, or ran out of time and energy. It’s been a few days, but I’m pretty sure it was the latter. Thanks for the reminder, though!